The Jarvis Model BS-1 — brain sucker removal system for removing all the material in brain cavity. Avoids contaminating heads and saves cheek meat. Permits de-boning of heads on tables, without cross contamination. Eliminates placing corks in heads – avoiding any brain seepage. 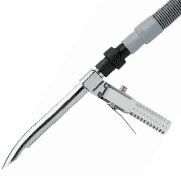 Lightweight handpiece for optimum operator comfort and handling.